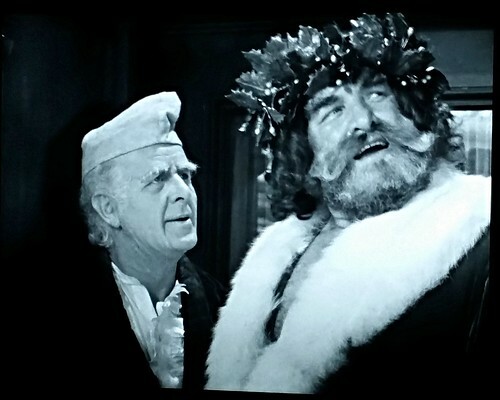 A scene between Ebeneezer Scrooge and the Ghost of Christmas Present in the 1938 version of A Christmas Carol. Merry Christmas to those that celebrate it! Every year, my wife and I try to watch a Christmas movie we haven't seen and so when we looked at what was on Netflix this became the most likely option. It's a pretty straightforward version of A Christmas Carol and all wrapped up nice and neat in under 70 minutes. I grabbed this photo as within this version (I can't remember in the original) is the real turning point for Scrooge, wherein he decides to celebrate Christmas after seeing Bob Cratchett's family and his nephew. I find that was a bit different from my memory wherein it seems like the only reason he changes is when he encounters the Ghost of Christmas Future and sees his death and how people think about him afterward. This version seems much less transactional and much more redevelopment of him as a person. It's nice to revisit this film and learn something new!